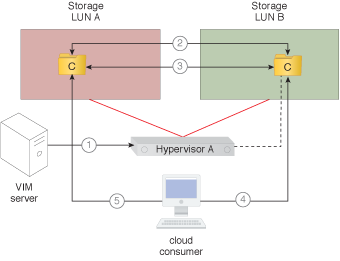 How can a virtual server be kept on the same hypervisor when its configuration files and virtual disks are being moved to another location? A virtual server needs to be kept on the same host while its configuration files and virtual disks are being transferred to another location. The folder containing the virtual server’s disks and configuration files is moved to another LUN or cloud storage device without modifying the virtual server host. The folder containing the virtual disks and configuration files is transparently relocated to another storage destination, without impacting the virtual server’s operation or functionality. The steps comprising the application of this pattern are illustrated.